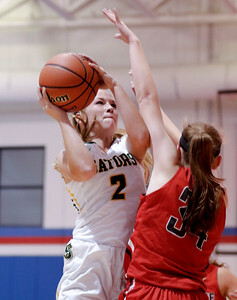 Sarah Nader - snader@shawmedia.com Crystal Lake South's Maddie Bush shoots over Palatine's Sydney Rzepka during the third quarter at Friday's Dundee-Crown Girls Basketball Thanksgiving Tournament Nov. 17, 2017. Crystal Lake South lost in overtime, 40-41. 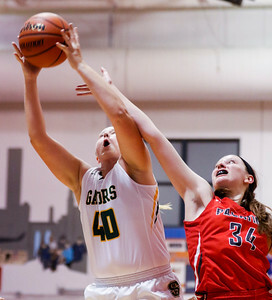 Sarah Nader - snader@shawmedia.com Crystal Lake South's Ava Sevcik shoots over Palatine's Sydney Rzepka during the third quarter at Friday's Dundee-Crown Girls Basketball Thanksgiving Tournament Nov. 17, 2017. Crystal Lake South lost in overtime, 40-41. 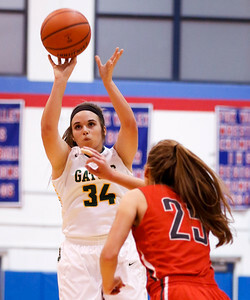 Sarah Nader - snader@shawmedia.com Crystal Lake South's Brooke Kuffel shoots a basket during the second quarter of Friday's game against Palatine at the Dundee-Crown Girls Basketball Thanksgiving Tournament Nov. 17, 2017. Crystal Lake South lost in overtime, 40-41. 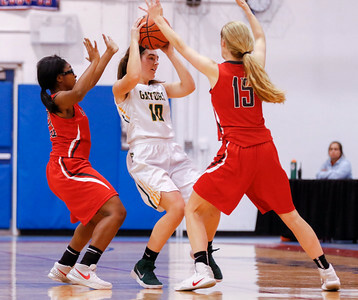 Sarah Nader - snader@shawmedia.com Crystal Lake South's Lauren Schoen (center) passes the ball during the third quarter of Friday's game against Palatine at the Dundee-Crown Girls Basketball Thanksgiving Tournament Nov. 17, 2017. Crystal Lake South lost in overtime, 40-41. Sarah Nader - snader@shawmedia.com Crystal Lake South's Emily Sulikowski (left) and Palatine's Sydney Rzepka reach for the rebound during the second quarter at Friday's Dundee-Crown Girls Basketball Thanksgiving Tournament Nov. 17, 2017. Crystal Lake South lost in overtime, 40-41. 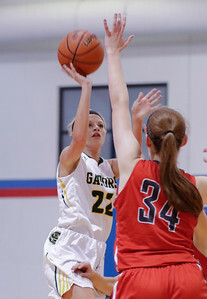 Crystal Lake South's Brooke Kuffel shoots a basket during the second quarter of Friday's game against Palatine at the Dundee-Crown Girls Basketball Thanksgiving Tournament Nov. 17, 2017. Crystal Lake South lost in overtime, 40-41.